Last Tuesday the first continental game for Tottenham Hotspur in the new Tottenham Hotspur Stadium took place. In the first leg of the quarter-finals of this year’s Champions League, they hosted Manchester City. Since both teams have outstanding talent in their squad, everyone expected a stunning match. As you could also expect with Mauricio Pochettino and Pep Guardiola on the sidelines, it was a tactical battle. Due to some strange mistakes in the positioning of the players during the Citizens’ build-up and the well-organised defence of Spurs, the Londoners won 1-0. This tactical preview will show what this result, and the injury of Harry Kane, mean for the second leg. Both teams lined-up in a 4-2-3-1. However, during the game, the formation of Guardiola’s team in possession looked totally different. On the other hand, Tottenham played during the game like in the image below. There were just minor adjustments by Pochettino to defend in a 4-4-1-1 or 4-4-2, but no great changes. 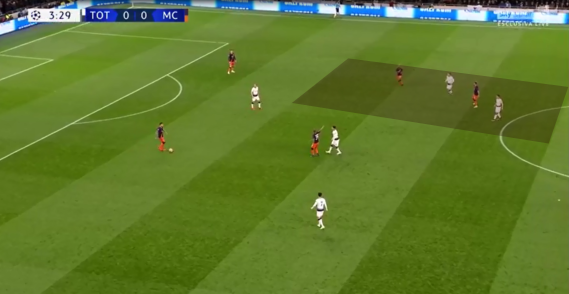 At the beginning of the match, Manchester City tried to use an asymmetric formation when they were on the ball. Fabian Delph shifted in to create numerical superiority in the middle. Kyle Walker stayed deep to create a back three with the centre-backs and David Silva pushed forward to support Sergio Agüero in the last line. 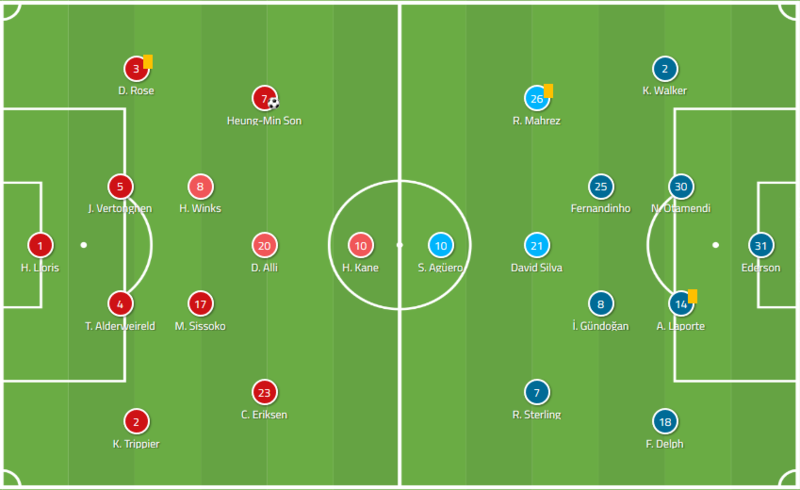 The two wingers Raheem Sterling and Riyad Mahrez stayed in their positions to provide the width and get into one-on-one situations with the opposing full-backs. Manchester City’s formation during build-up during the first 10 minutes. But there was a huge problem. When Delph shifted in, he occupied the same space as Ilkay Gündogan. In light of this, you could say that they took out one of their own players by themselves, a mistake which you almost never see when you watch a Guardiola team. Delph and Gündogan occupy the same space. In addition, Tottenham pressed Manchester City very well and high up the pitch. Kane put pressure on the man on the ball and cut off the passing options to one of the centre-backs. Dele Alli man-marked Fernandinho, and Heung-min Son looked after Walker. Because of the positioning of Delph and Gündogan, it was easy for Christian Eriksen or Harry Winks to cut off these passing options. Furthermore, Toby Alderweireld followed Agüero when the Argentinian dropped deep, and so Manchester City’s striker was always marked. Between around eight and 10 minutes Guardiola changed the structure of his team in possession. 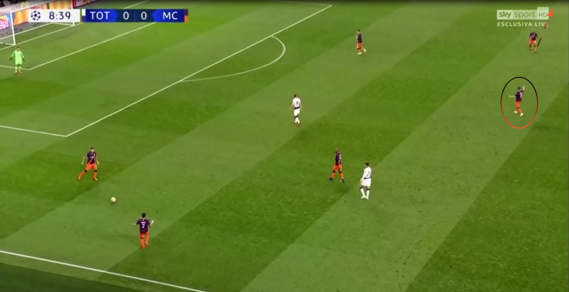 From then on, Delph stayed in the wide areas and Gündogan occupied the base of midfield together with Fernandinho in the centre. Gündogan tells Delph to get out wide. As the full-backs of City shifted forward and Silva joined Agüero in the last line, the Citizens used a 2-4-4 when they were in possession. However, when you use this formation there are hardly any triangles and almost only horizontal and vertical passing lanes. These aspects are normally the total opposite of the things Guardiola wants to have. 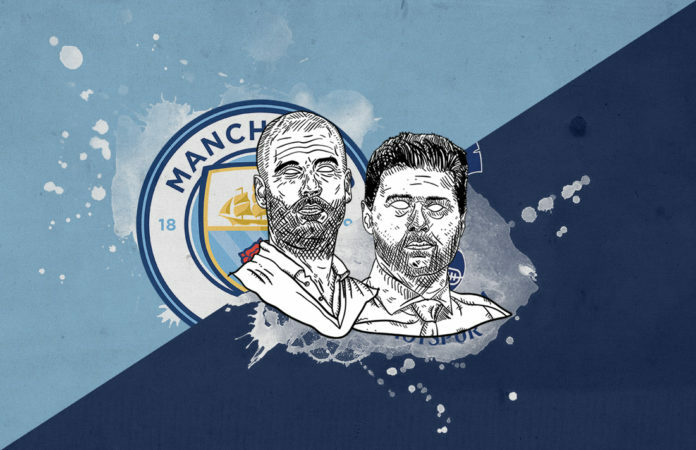 Pochettino’s team continued their high pressing and so Manchester City never really got into the game. Manchester City’s formation during the build-up after the first 10 minutes. Mahrez is too wide to be seen in the image. Because of the golden strike by Son in the 78th minute, Tottenham got away with a 1-0 victory in the first leg and are in a good position ahead of the second leg at the Etihad Stadium. Besides the technically outstanding midfielders Alli, Eriksen and Son, and the talented right-footer Winks, there is another midfielder in Pochettino’s squad who proved his importance for the team this season. Moussa Sissoko is the total opposite type of player compared to the other four men. His technique is not amazing, but he brings totally different components to Tottenham’s midfield: defensive ability, strength and stamina. His usual partner in defensive midfield, Winks, often wins the ball due to his good positioning. On the other hand, Sissoko is also capable of intercepting passes but he is even better when it comes to tackles and sliding tackles. In the image below, he has the self-confidence and the right timing to win back the ball from Sterling with a sliding tackle. Furthermore, he has got the power and pace to run down the whole pitch for a counter-attack. 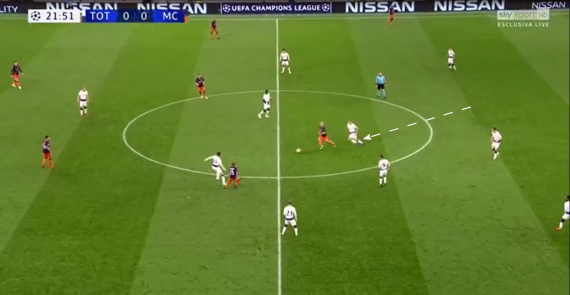 Since he’s a defensive midfielder, the distance to the opposing goal is usually quite far but he often shows such runs like in the image below. Sissoko with a run which starts in his own half. Before his move to Tottenham, Sissoko played for Newcastle United. On Tyneside, he mostly played as a right winger or attacking midfielder. Considering this, he has still somehow got the instinct of an attacking player which probably also explains his forward runs like in the image above. In addition, he has still got the ability to cross. He also showed this in the first leg. After the deep run which started in his own half, he found Alli with a great cross in the box. However, the young Englishman’s shot went wide. A perfect cross by Sissoko. In conclusion, Sissoko’s impact on the game of Tottenham isn’t always obvious at first glance. However, he’s important for the team because of his huge amount of different qualities which he showed in the first leg against Manchester City. England’s captain has sustained a lateral ligament injury to his left ankle during last week’s game against Manchester City and won’t be able to play in the second leg. In addition, Alli fractured his left hand during Tuesday’s fixture. However, there is no confirmation that he can’t play and so his start in the second leg is doubtful. Kane had already been injured this season and missed seven matches between 20 January and 13 February. During this period, Pochettino used several formations and players. It is hard to predict which lineup the Argentinian coach will use this time to compensate for the absence of Kane. On the other hand, the Citizens will once more try to dominate the game with the aid of possession. As a consequence, Tottenham will have enough space for counter-attacks if they can overcome the counter-pressing of Guardiola’s team. The perfect player for counter-attacks in the Spurs squad is Lucas Moura. He has got undoubted pace and a fine technique to control the ball. The Brazilian also likes to make runs behind the opposition’s last line. He is currently on good form which he showed at the weekend when scoring a hat-trick against Huddersfield Town. Son plays a through-ball to Lucas who scores his third goal of the day. With Son and Lucas, Tottenham would have two fast players who combine well. In the image above, Son plays a good pass behind the Huddersfield defence for Lucas to score his third goal of the day. In addition, both like to lay balls off before making deep runs as in the image below. These aspects could see Pochettino line up the two men together to have excellent players for counter-attacks. Lucas passes the ball and immediately starts a deep run. The most important aspect which the Catalan needs to improve is the positioning of his players in possession. 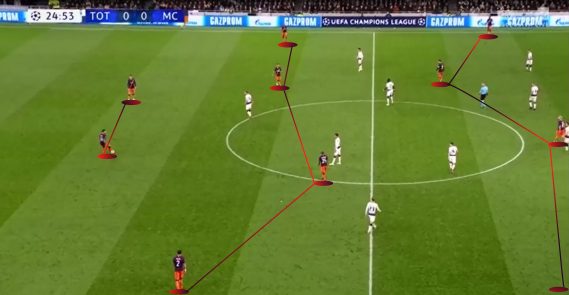 Neither the asymmetric 3-3-4 nor the 2-4-4 really worked in the first leg. He could, for example, play with a real left-back like Benjamin Mendy to provide width instead of Delph who shifts into the middle. However, Kevin De Bruyne, Leroy Sané, Bernardo Silva and Gabriel Jesus are other options for switches in personnel. 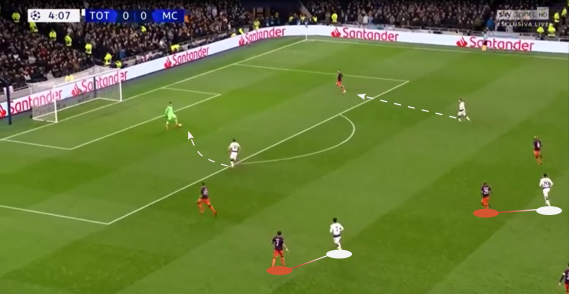 De Bruyne and Silva especially are players who are able to move between the lines of the opposition and then receive the ball in one of the half-spaces. Both can create goalscoring opportunities from there. Manchester City must score at least one goal. Considering this, Guardiola’s team will be as attacking as always, if not more so. This will create spaces for Tottenham’s counter-attacks. Because of that, the Catalan will try to improve Manchester City’s counter-pressing compared to the first leg. On the other hand, you never know which game plan Guardiola will have in place this time. Maybe he will surprise everyone with a totally different concept. In a nutshell, this game promises to be more spectacular than the first leg. Once again we have two teams with great individuals, but this time the Citizens have far greater urgency to attack. Spurs’ counter-attacking quality is a well-known factor that shouldn’t be ignored. It will be interesting to see who goes through to the semi-finals and if Pochettino can take one step closer to his first title as a coach. The Champions League would be an incredible place to start. Meanwhile Guardiola is in his third year at Manchester City, and everyone expects him to win the biggest trophy in European club football. It would be devastating if they couldn’t reach the semi-finals at the third attempt under Guardiola. Previous articleWere there weaknesses to be found in Manchester City’s controlled demolition of Crystal Palace? Next articleDo Porto have what it takes to overcome Liverpool’s two-goal advantage? My name is Felix. I am a 19 years old youth coach and based in Austria. 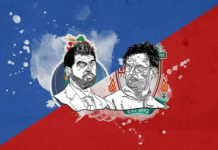 Do Porto have what it takes to overcome Liverpool’s two-goal advantage? 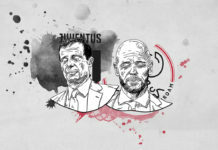 Is Juventus’ squad versatility the key to success against Ajax? 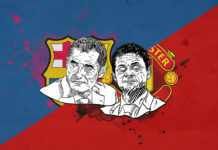 Will Barcelona be able to administer the final blow to Manchester United?